Its pretty rare these days that I watch a TV show for the first time and instantly like it. Usually, a show takes time to grow on me or, in many cases, doesn’t and I end up moving on to something else. Like most people, my time is valuable and I only have so much, so I want to spend time where it counts watching shows of quality. 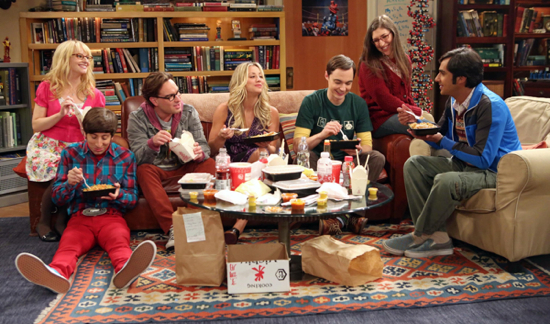 Much to my happiness, The Big Bang Theory is a show I instantly liked and have been a devoted watcher of from day one. The setup may seem rather familiar to anyone who’s watched a sitcom in the last twenty years. Sheldon and Leonard (Johnny Galecki and Jim Parsons) two nerdy, comic book loving physicists live together in an apartment while they work at a nearby university. Their perfect world of video games, trips to the comic book store and Chinese food nights is thrown into chaos when the gorgeous Penny (Kaley Cuoco) moves in across the hall. Leonard, of course, is instantly smitten and begins to develop a friendship with the new neighbor that he hopes will eventually lead to more — much to the chagrin of his somewhat eccentric roommate Sheldon who, above all, values his routine and especially his particular seat on the sofa.